Stacey Pullen is the Kosmik Messenger. An innovator from the second wave of Detroit techno, he grew up under the mentorship of Detroit’s legendary three: Derrick May, Juan Atkins and Kevin Saunderson. 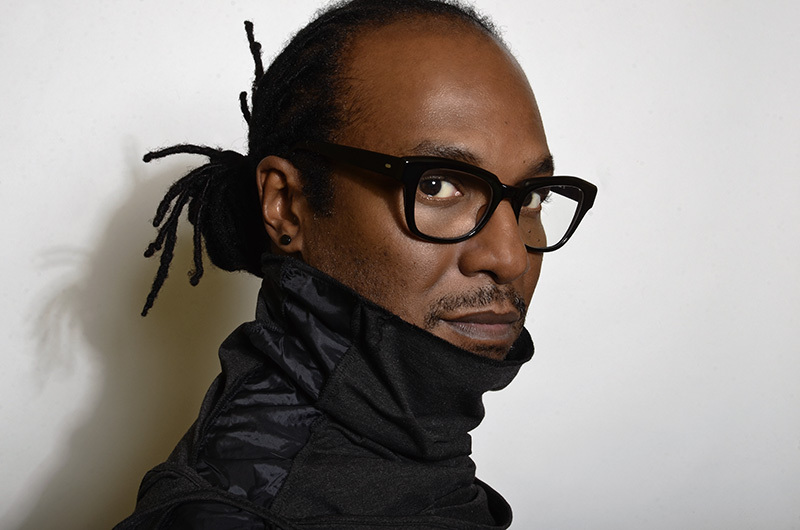 Still continuing to produce his characteristic atmosphere laden electronic sound, Stacey Pullen compounds his reputation as a producer with that of being one of the world’s most in demand DJs, playing weekly across the globe year in year out. With a font of passion for music and performance that never dries up, Stacey Pullen still plays every gig from the heart, seeking to surprise and engage, to provide an unforgettable experience, to offer his unique catalogue up without predictability, defying expectation. Above all, from his earliest attempts to the current day Stacey Pullen has stayed true to his one goal: to become and to always be an Innovator. From the age of 9, when he started playing flute in his school band, Stacey has always been playing musical instruments. In high school he found himself traveling around to a lot of cities in the USA playing percussion in school bands, which gave him a taste of – and preparation for – the traveling involved in life as a musician. He had also seen and been prepared for a musician’s life from watching his father who was in a Motown band called the Capitals in the 1970’s, filling much of Stacey’s childhood with observations of a life dedicated to music and travel. Around 1985, while Stacey was still drumming and traveling with his high school band, the Detroit Techno movement was born, and provided a revolutionary sound to the youth of Detroit. Stacey Pullen and some friends from his band took their cue from musical leaders like Jeff Mills and Electrifying Mojo Radio and began to experiment with turntables and a mixer. He also started clubbing around the age of 15, the first club he frequented was called ‘The Primadonna’, the first DJ he remembered was a local legend called Alan Ester and the first music he was clubbing to was called ‘Progressive Music’ – not in the sense of the word that we currently understand, but because, in Stacey’s words “the meaning of ‘progressive’ was a futuristic way of thinking about music.” After graduating he went to university in Tennessee, leaving techno behind apart from mix tapes and weekend jaunts back to Detroit to go to legendary club the Music Institute. After a couple of years, Stacey realised his future was in music not academics, and he abandoned his course and moved home to make music full time. Through The Music Institute, Stacey quickly got to know the leading lights of Detroit’s underground: Alton Miller, Chez Damier, Derrick May. Alton was living in the same building as the club, and showed Stacey a lot of the background activity, including watching Derrick May making his tapes for his weekly radio show. Stacey approached Derrick, told him that he made music and Derrick invited him to play some to him. From here, Stacey started hanging out at the Transmat studios and became friends with Jay Denham, who was recording on Transmat sub label Fragile as ‘Fade to Black’. Stacey watched Jay work, absorbed a lot of knowledge, and from there Stacey started putting more sophisticated beats together, making his first real tracks. He played some to Derrick who told him ” it’s cool but you need to work harder” – which Stacey resolved to do and went back to the studio. A couple of years later, in 1992, Derrick suggested that a good way to develop his skills would be for Stacey to do some remix work with Kevin Saunderson. Stacey began to work with Kevin on remixes including one for Karen White -‘The Way I Feel About You’ and some which never made it to print, including one for the Prodigy. While Kevin was originally commissioned, he asked Stacey to do his own remix. The Prodigy liked it, but their label didn’t. Stacey kept the backing track without the Prodigy samples, and turned it into his first track which was later released through a subsidiary of KMS in 1993. After some more time perfecting his craft Stacey again played some original sounds to Derrick, who agreed to release his first Silent Phase track ‘Ritual Beating System’ as the ‘Bango EP’ on Fragile, which was Derrick’s experimental label. Stacey was also invited to submit this track, “Wave The Rave Goodbye”, to a compilation of new Detroit artists on KMS. At this point Stacey truly became part of the Transmat/Metroplex/KMS team – the three studios worked very closely together, and were housed on different floors of the same building in downtown Detroit. In early 1993 Derrick, who was spending most of his time outside the USA at that time, started encouraging Stacey to play gigs in Europe to widen his audience and support the single. He invited Stacey to join him in Amsterdam for a month – that month became a year. He moved in with Derrick and together they toured Europe every weekend playing Detroit techno to what Stacey remembers as an enthusiastic and interested audience. Stacey began to play high profile gigs at clubs like London’s Ministry of Sound and Paris’s Rex Club, and began meeting the DJs and artists who worked in Europe like Laurent Garnier, Frank De Woolf and Renat and Marcus Loan from Belgian super label R & S, who invited Stacey into the studios to make a record. This ended up becoming the first Silent Phase album, ‘Theory of Silent Phase’ in 1994. After a year, Stacey moved back to Detroit, ready to establish himself and start his own label. Throughout 1994 he commuted between Europe and the USA, finishing the Silent Phase album at R & S and DJing. He also made his first trips to Japan, South East Asia and Australia to DJ. By then he had released another Fragile track ‘The Sphinx’ as Bango, and the first Silent Phase album was ready for release on Transmat in association with R & S. Flooding in after the album release were a lot of offers for Stacey to record on other labels, including one from Mr. C to record on his UK label Plink Plonk. This resulted in a couple of released on Plink Plonk by the alias ‘Kosmik Messenger’ – ‘Eye to Eye’ and ‘Flash’ -both released in 1995. Stacey was also DJing a lot of dates at The End and around Europe, which continued non stop until 1997. Through his releases on Plink Plonk, Stacey was then invited to release on the new Belgian label ‘Elypsia’ as ‘Kosmic Messenger’, which led to the release of his second LP ‘The Kollected Works of Kosmic Messenger’, which Stacey recollects as a ‘straight up techno album’ for him, after the more spiritual first album on Transmat. In 1998 Stacey was invited to produce his very first major label release on Virgin Records, and at the same time was planning to open the label he had wanted to startfor about three years ‘BlackFlag’. He recorded a more conceptual LP ‘Today is the Tomorrow You Were Promised Yesterday ‘ for Virgin imprint ‘Science’, the first under his own name. He was very influenced by his research into the history of Jazz, and – with the support of Virgin – used unorthodox ideas including the inclusion of an Opera Singer on one track ‘Vertigo’. He also released remixes from influential artists of the time like Dave Angel and 4Hero. He also started his first label Black Flag Recordings with his partner of that time, and started releasing records as ‘Black Odyssey’, starting with ‘Sweat’ in 1998 and then ‘The Stand in 2000’. Around that time, as vinyl started to look a little shakier and after 8 years of consecutive releasing and touring, Stacey took a break from recording. He began to ramp up his DJing schedule even more, and spent the next 4 to 5 years concentrating mainly on furthering his own musical education. Through this time, Stacey’s reputation as a DJ became as much of a draw card as his reputation as a producer, and he became renowned for long, experimental, adventurous and soulful journeys through music lasting at least 5 hours. He sees each set as a ‘best of’ all dance music through time – there is no one style he prefers, Stacey just plays the best of everything, with an emphasis on passion and innovation: no two sets are alike.